This is not new but it seems to be a very popular cake, so I am sharing the recipe again. I made this cake for my hubby's good friend's birthday and everyone just loves it. I think it's combination of flavours that is familiar and comforting for us Malaysians. Pandan, gula Melaka and coconut just go together well! 66g homemade pandan juice (screw-pine leaves juice), very thick and concentrated juice. Sift flour, salt and baking powder. Set aside. Unmould as soon as you can. To remove the cake from the pan, run a thin-bladed knife around the inside of the pan and invert the cake on non stick baking paper. Peel off baking paper from the base and re-invert onto a rack to cool. You can also invert the cake and let it cool completely before removing the cake tin. Combine gula melaka, pandan leave and water in a saucepan and bring to boil over medium heat. Keep on stiring until all the sugar has melted and reduce slightly. Remove from heat, strain & discard the pandan leaves. Keep aside to cool. The syrup will thicken as it cools. Turn down the speed and in gula melaka one teaspoon at a time. Scrap the bowl with spatula and beat until all well combined. I used all the gula melaka caramel. You are not required to use all the gula melaka caramel. Cake board, cake turntable, off-set spatula, icing smoother, piping bags, round tip nozzle and swirls nozzle. Cut the dome off from the cake if necessary and place on a cake board. Place the cake on turntable. 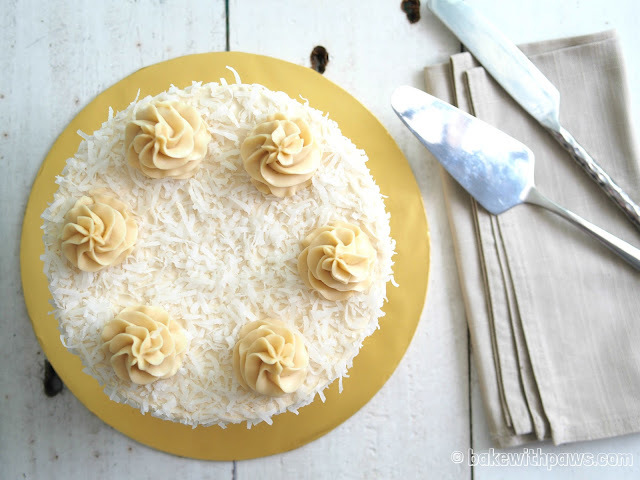 Spread a layer of Gula Melaka Swiss Meringue Buttercream (GSMB) on top of the cake. Then stake the second cake on top. Crumb coat the entire cake and leave in the fridge for 10 to 15 minutes. Place GSMB in a piping bag fitted with a plain round tip. Pipe rings around the cake starting from the bottom till the top. Once finished piping, use an off-set spatula to smooth the top. Then smooth the excess icing at side of the cake too. 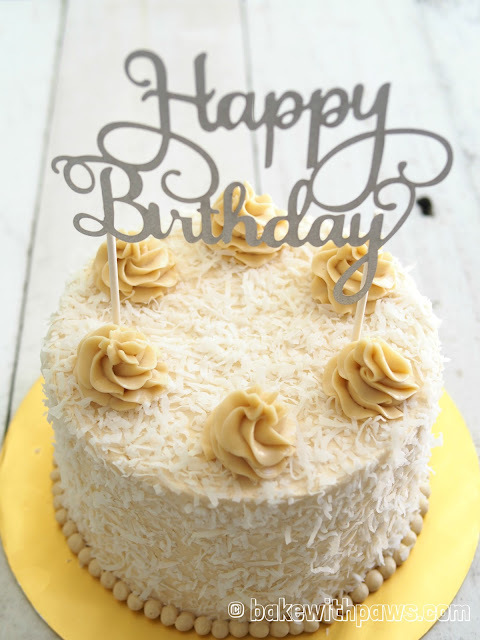 Sprinkle whole cake with coconut flakes and pipe swirls. 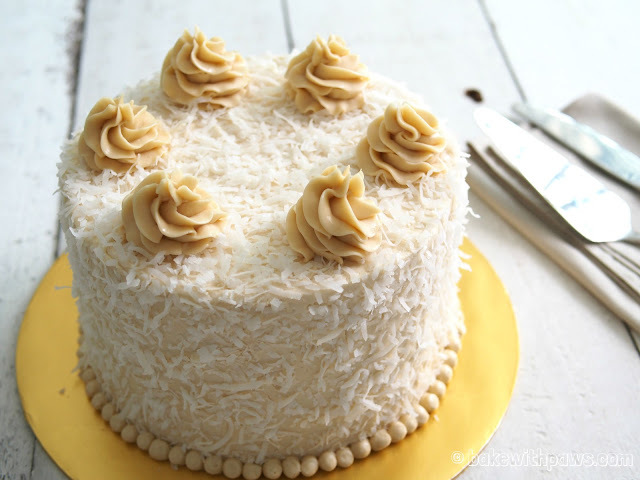 Is there buttercream turn out to be runny after adding the caramel, what should I do? Hi Jasmine, Thank you for your question.. Please don’t add all the Gula Melaka caramel. Add 1 tsp at a time until you get the color and taste you desired. Adding too much caramel may make your buttercream too runny..